Gucci's New Bamboo bag wasn't one of my favorite designs. It was just a little complicated and overthought. This update is a major improvement. Instead of adding more bells and whistles, Gucci's pared the design down considerably, and it's totally transformed the look. The olive leather on the bag is beautiful and practical. It's a really neutral shade, but one that's still interesting. The texture is really smooth, which makes the beautiful upraised seam detail stand out even better. The New Bamboo is one shapely handbag. It's curvy in all the right places, but it still retains a beautifully tailored and structured look. The bamboo details that I hated on the previous version look great here. The lack of over-embellishment makes the quirky bohemian details seem streamlined. The rounded bamboo strap is a dramatic touch. 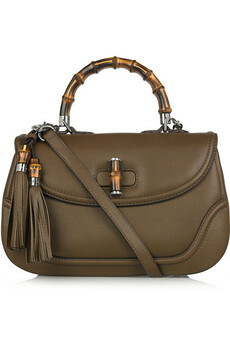 I honestly love this bag, but I'm still not sure about its $2,350 price tag. My concern is that it might look dated in a few seasons and that retro still might be decades into the future for this particular design. My advice is to wait for a sale.